Review In A Nutshell: Restore Me is an amazing installment in a breathtaking series. I questioned if another book in the Shatter Me world was really necessary, but after reading this novel I had no doubt in my mind that this story had to be told. Restore Me begins right where Ignite Me left off, just a couple of weeks after the battle that left Juliette the Supreme Commander of the Reestablishment. 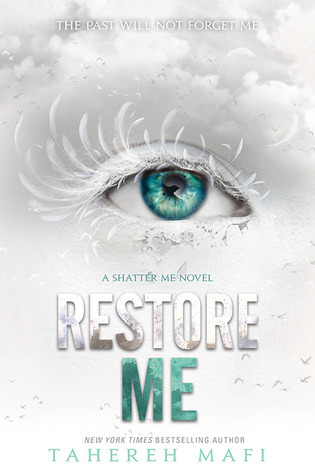 Told through both Juliette and Warner’s points of view, Restore Me shows the aftermath of the revolution, Juliette’s struggles to handle her new responsibilities, and the world’s response to the events of the last book. It brings up questions that a lot of YA dystopians just ignore, for example, how a teenage girl can run an entire country, and also further flushes out the world that Shatter Me takes place in. Restore Me was a great read. The plot is gripping, although while there is some action, most of the plot revolves around politics and revealing the past. There are some great topics brought up naturally in the story that hasn’t been mentioned in the previous books, such as racism and transphobia. The topics are handled really well and I loved seeing these important subjects discussed in such a great way. For the most part, this book focuses mostly on character dynamics, important politics, and dancing around secrets that will completely surprise you. I swear the plot twists in this book are incredible. Tahereh Mafi continues to develop the characters, giving them opportunities to grow and change, and revealing more about their pasts and secrets. There are a few new characters introduced, and while I’m excited to learn more about them and their backgrounds, the original characters were the true focus. Kenji, as always, steals the show just by being him. Juliette is a force to be reckoned with in this book, despite being overwhelmed with everything piled on her. And Warner is as fascinating and interesting a character as always. Seeing from his Point of View really adds further depth to a character already as deep as the Mariana Trench. I don’t want to spoil anything, but I did want to mention one thing I loved. While it isn’t a big spoiler, or really anything important, it is something I have to mention because I absolutely loved it. (Just skip the rest of this paragraph to avoid it) Warner has a panic attack in this book, and that small reveal absolutely made my day. I love seeing an accurate representation of mental illnesses in fiction, and especially in one of my all-time favorite characters. This book spent more time delving into the setting, into the past of the Reestablishment, how it came to be, and how it functions. While there were references to how the Reestablishment rose to power in previous books, Restore Me explains in further detail the world the characters live in. So far, there are quite a few puzzle pieces that we’ve been given and I am dying to see the full picture of what happened to our world and how it became the way we see it in Shatter Me. Cons– Cliffhanger ending!! Why!!! Also, this book hurt me so bad, and that is not allowed. The original Shatter Me books were great, but Restore Me takes this series to the next level in a way you will not see coming. I love your blog so much! I love your posts and reviews and I love how you include content warnings! You’re welcome!! Awww thank you that means a lot!